The Truck Accident Center tracks information on large trucks over 10,000 pounds, including semis, cargo and delivery trucks, gas tankers, fire trucks, government vehicles, buses and construction trucks. The public safety advocates at TruckAccidentLawsuit.net have launched a new online resource center for victims and families seeking help and information following an accident with a large truck. 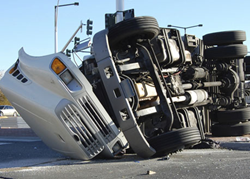 The Truck Accident Center is a free resource providing the latest information on truck safety, state and federal regulations, accident news and lawsuits filed by those affected. Visitors can learn more about truck laws and accidents in their area, and decide if they need legal advice following a crash. A recent study by the National Highway Traffic Safety Administration found that, although large trucks represent only about 4% of the vehicles on roadways, they are involved in a disproportionately high number of accidents resulting in injury or death*. Reports also show human error or faulty equipment is often the cause**. Those who have been injured of lost a family member due to a truck accident are encouraged to visit The Truck Accident Center or speak with a lawyer about their options. The Accident Center only recommends lawyers who have already handled heavy truck and complex injury lawsuits.